This is my second attempt at writing this blog post... the previous one died after Google decided to log me out and my browser crashed. Grr. Anyway... thank goodness - 2010 is all done and dusted, welcome at last to 2011. I don't know about you... but I don't really have any major resolutions worked out yet. I don't have a road map as such. I do know that this year will mark out a few changes for me, personally. Some of the opportunities that have given me greatest sense of joy , fellowship and sowing spiritual seeds, will not be available to me this year; those doors are closed this year it would seem. The Bible teaches us that there is a time to sow and a time to reap... and that while one person sows, another reaps. Whilst I will continue to look for opportunities to serve, I do wonder if I am entering into a time where I will be able to reap things. As we begin the year, I am feeling an urge to once more spread my wings and broaden my horizon. I am not like Luke Skywalker gazing forlornly into a binary sunset... wondering if things will ever change. Things will change... they always do. We just have to be prepared to make and take opportunities... and most of all, trust in God. Things will change. They always do. It just takes time, trust and action. In the words of Bilbo Baggins "I think I'm quite ready for another adventure". Although, I don't think I'm quite ready to be shipped out to the Undying Lands just yet though. No, there are plenty of japes, jollities, wonders, mischiefs and new discoveries yet to be experienced on this good Earth as yet. I start this year as I mean to go on... thinking positive and looking for the opportunities and defining moments the year will bring. I've already begun looking at some options. Later in the year, I hope to go on a tour of Italy. One day, a man stole an egg from the nest of a golden eagle... and he took the egg and left it nestled among other eggs in a chicken coop. One by one, all the eggs hatched and among them was the infant eagle. It spent every day for many years living among the chickens and scratching for food in the dirt, content with its lot... never having reason to question it's purpose or differences. Then one day, a piercing cry was heard from above... and a silhouette... a strange yet somehow familiar shadow, swept across the farmyard. High above the farm below, an eagle circled in the bright sunlight. The eagle asked his chicken "siblings" what this strange new bird was. "That is an eagle, he belongs to the sky... we are chickens, we belong to the Earth" they replied. Our earthbound eagle looks to the sky and ponders... he is about to dismiss all he has witnessed when he hears the eagle cry once more... and a breeze blows beneath his wings... gently ruffling his feathers. Instinctively.... the eagle scuttles across the farmyard beating it's wings. It catches the breeze, takes to the sky... and finds the thermal that takes it up to it's fellow eagle high up in the clouds and sunlight. We need to learn from the eagle... living on the vertical as well as the lateral. Like the eagle, our beliefs and opinions are shaped by our experiences; this is never more true than where our self-perception is concerned. We enter this world and live out our daily lives along a lateral axis... because that is what we see in the world around us. However, there comes a time for all of us sooner or later... when we are challenged by a call to live on the vertical as well as the horizontal. Taking into account what I said a few days ago at the end of last year... this is equally true for those of us who have already embraced a call to follow God. How easy is it to get entangled with the red tape in our lives... or to run with an idea given from God on the vertical... but use only the resources of the human lateral to carry it out. We need to keep our ears to the ground and our eyes to the horizon... listening and watching for the whispers, signs and moments that empower us and transform us - that immeasurable help from above that causes us to amend what we are and shapes what we should be. It is so easy to forget the vertical and live out life on the lateral... we need to remember there is more than just the complexities of modern life. Why do you complain, Jacob? Why do you say, Israel, “My way is hidden from the LORD; my cause is disregarded by my God”? Do you not know? Have you not heard? The LORD is the everlasting God, the Creator of the ends of the earth. He will not grow tired or weary, and his understanding no one can fathom. He gives strength to the weary and increases the power of the weak. Even youths grow tired and weary, and young men stumble and fall; but those who hope in the LORD will renew their strength. 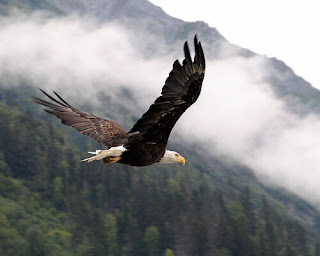 They will soar on wings like eagles; they will run and not grow weary,they will walk and not be faint. I'll let you into a little secret... it's just between you and me. Part of my problem in previous years is that I have felt very much like Jacob and Israel. I have felt that my cause has been disregarded by God... that I'm out here trying to walk in his ways, while others have reaped the benefits that this life has to offer, regardless of what choices they have made. You see, the temptation is not to stare at the horizon... or not to look to the eagle in the sky. The temptation is to become downcast and gaze at our toes... or look at the successes of the chickens around us and grow in despair. If we are different... then we are not going to find what we are looking for in the same places as others. We have to decide what we are. We have to find our own voice deep within and sing with all our hearts. When it comes to who we are as individuals... we cannot be a half or a part of something. You either are or you are not. If our heart is calling us to be something and we repress it... it will in the long run reassert itself with a vengeance and either consume us or leave us feeling lost and wasted. If we can but trust in the Everlasting God who loves us... he will lift us up and give us the strength to claim our true destiny... and become the people we are meant to be. Though our feelings might suggest otherwise... they are temporary and subject to change. The Everlasting God does not faint, does not grow weary and does not forget his promises to us.